If there's one thing I should know by now about my creative process, it's that I really only have a minimal say in what I'm going to work on next. My creative brain does what it wants to, when it wants to. So, although I'm excited about writing orchestral music and applying everything I've learned to date, the needed kernel of a suitably grand idea hasn't yet sprouted in my head, and I've been spending my creative energies primarily on writing new songs and practicing various instruments. I've been trying some new things when it comes to songwriting. For one thing, I've been playing piano a lot more regularly. Since I'm less competent on piano than on guitar, it causes me to think about music a little differently and to play chord sequences I'd never think to play on a guitar. I don't necessarily have muscle memory around certain note patterns like I do with the guitar. For another thing, I've been focusing more on writing music and lyrics in my head. It's an idea I've always been interested in. I'm one of those people who always has music playing in his head. I've spent a lot of my creative life trying to get that music out of my head and into some kind of usable format. The challenge in the past has always been picking up an instrument and playing the music I was imagining without it turning into something else while I tried to figure out the notes. I've really only recently gotten to the point where the finished product sounds like the original song in my head. Another development in my life has been spending a lot more time on a bicycle. I've ridden more than a thousand miles already this year. 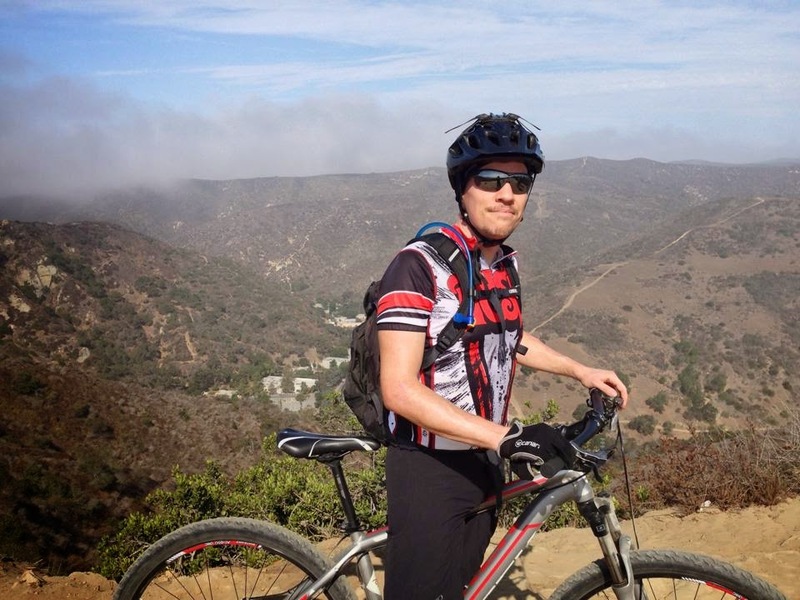 I especially gravitate to mountain biking, because I love to be out in the wilderness interacting with the wildlife. I realized over many long rides that my brain works overtime while I'm riding. Unless I intentionally focus myself on a topic, I'll tend to think about work and other topics I don't want to spend my free time on. So at some point, I decided to focus on writing lyrics while on my bike. Staying focused on something like that is easy for me. The lyrics go around and around in my head while I figure them out, and then I get a verse or two finished and I dictate them into my cell phone before I forget them! The trouble for me with lyrics tend to be getting started. I need a basic idea to build upon. Sometime late last year, as I was leaving on a long bike ride, I asked Christina to give me a topic to write about. Her quick answer was "Love." Well, that's all fine and good, but I don't tend to write love songs, do I? I asked for another topic... "War," she said. I decided to combine the two topics, and I wrote the lyrics to "War and Love" on that bike ride. I tried to imagine how I'd feel if I were a soldier fighting in a war, and how much I'd rather be home safe in the loving arms of my wife. It worked! The funny thing was that as I was writing those lyrics, repeating them over and over in my head to get to the next line, I was singing a melody in my head that went with them. For weeks after that, as I tried to turn the lyrics into a 'real' song, the melody came back to me relentlessly. In the end, I decided not to fight it! I just figured out chords around the melody, and that was that. I like the song. We've played "War and Love' at one of our coffeehouse shows, but we haven't recorded it yet. I think we'll play it at our next Ascent gig. Well, the subconscious is a powerful thing. The words and melody of "Disappeared" wrote themselves very quickly. I don't think I realized what I was really writing about until I was already two verses in. I'm not going to reveal that here, but I suspect those closest to me will figure it out. The other crazy thing here is that the melody I wrote while mountain biking was really good. I didn't even consciously think about it. It just happened. Since I've been spending so much time at the piano, I sat down at the piano with that melody in my head and played chords to go with it. Christina picked up the verse melody very naturally and easily. When she sings my melodies, she applies style, substance, and detail to them the way an artist does with a fine brush. There's still a thrill for me in hearing my melody sung so well by a real singer. "Empty Streets" is another song I wrote in a similar manner to "Disappeared." The topics were "Epidemics" and "Oil Drilling." So, as a longtime fan of post-apocalyptic science fiction, I naturally wrote a song about survivors in an abandoned Alaskan city after the great plague has wiped out humanity. Oh yeah. And it's a good song! It's another piano song. We are working on this one. Christina wrote the (heartbreaking) words to Bearing Witness about our beloved dog, Berkeley, who passed away last year. Her words are powerful and personal. In his final months, Berkeley spent a lot of time lying by the piano while I played, trying to figure new ideas out. I intentionally wrote the music for Christina's lyrics around one of the tunes I'd been playing a lot while Berkeley was listening. Oh yes, there are several more new songs where those came from, but I'll just keep you wondering for now. Hopefully, they will all show up on a new Ascent CD in the next year or so. In case you missed it, there was one new orchestral piece last year, which was Heroic Theme . I posted the music on this site but never wrote about it. It think it could have a separate life as the theme for a movie or a grandiose TV commercial, but it's still searching for a home. I was lucky enough to find a couple of licensing deals for it, but not quite lucky enough for those deals to follow through to fruition.